With the new series of Doctor Who starting this weekend now seems a good time to reminisce about the Timelord as he was in the 1980’s. For many Tom Baker is often the most remembered incarnation of the Doctor, but given that he hung up his scarf and bag of jelly babies in 1981 after playing the character for seven years, I shall start with the fifth Doctor, Peter Davison, who incidentally also sang the theme tune to Button Moon with wife at the time Sandra Dickinson, fact fans! Peter Davison’s was the youngest actor to play the role (he was only 29 when he started). The fifth Doctor had a bit of a shaky start, similar in fact to current Doctor David Tennant who was also not in tip top form for most of his debut story. The regeneration process didn’t quite work properly, and for the first few stories Davison’s Doctor was shaky on his feet, at one point needing to rest in a special coffin like box to aid his recuperation. He swapped the long scarf for the garb of an Edwardian cricketer, with long cream coloured over coat, orange and yellow stripy trousers and a creamy coloured V-neck jumper. He did retain the distinctive embroidered question marks from Tom Baker on his shirt collar however. The fifth Doctor was also a departure in that the character was far more serious with less of the frivolity and flippancy of Pertwee and Baker. He had also become much much more likely to listen to the advice of his companions rather than charging gung ho into the situation. So much so, that this was considered a good running joke for the Children In Need special aired in 2007, which I’m quite annoyed that I missed. In it the fifth and tenth Doctor’s get to meet each other, with Tennant’s Doctor apparently belittling Davison’s at any opportunity. This Doctor also tended to have more than just one companion, with the pictured trio of Adric, Tegan and Nyssa being his initial companions. Adric was a mathematics champion who was killed trying to save the Earth in the episode Earthshock, a first for a companion which affected the Doctor’s character deeply. Tegan was an Australian flight attendant, who left because she could no longer stand all the death and destruction that still followed the Doctor around. Nyssa was the daughter of an aristocrat from the planet Traken. Her father’s body ended up being taken over by the evil Timelord The Master, who could no longer regenerate. She was the first of Davison’s companions, being the last of Tom Baker’s. I’ll finish with my favourite Davison Doctor Who anecdote. I was once watching the story “The Caves of Androzani” with a big Doctor Who fan friend of mine. Whilst watching the Doctor belittling the black and white masked villain of the piece, we suddenly realised he was doing so with his flies wide open! This entry is filed under TV - Kids, TV - Teens	and was posted on April 4th, 2008. You can follow any responses to this entry through the RSS 2.0 feed. You can leave a response, or trackback from your own site. I started to watch Doctor Who just before the Tom Baker Doctor’s regeneration, and remember finding his transformation into the Peter Davison incarnation quite a shock (such was my childish ignorance at the time that I thought that, before then, Tom Baker had been the only Doctor!). Unfortunately, I didn’t get a chance to watch much of the Fifth Doctor’s run when it was first on (due to Doctor Who often clashing with teatime in my house, and VCRs only just starting to come on the scene back then); it would not be until more than twenty years later that I’d finally get a chance to watch all his stories. Unfortunately, I don’t think his Doctor was one of the more successful ones, probably because he didn’t get to enjoy nearly as many years in the role as Tom Baker did, and also because his character got lumbered with some truly awful stories. That said, there were some Fifth Doctor stories I quite enjoyed, such as Earthshock, The Caves of Androzani, Resurrection of the Daleks, Four to Doomsday, and even the oft-derided Warriors of the Deep. As for his companions, my feelings towards them are mixed. Although I’ve heard that Adric was perhaps the most widely-loathed of all the Doctor’s companions, I actually didn’t mind him*, and feel that, whatever one’s feelings towards him ordinarily, one would have had to have had a heart of granite not to find his death at the end of Earthshock at least a little moving, particularly when he was shown clutching his deceased brother’s reed belt (perhaps in anticipation of joining him soon). Nyssa was probably my favourite companion, though, as I thought she was quite attractive, and also one of those female companions who wasn’t utterly useless (I did think it was in rather poor form, though, for the writers to have the Doctor save her homeworld in one story, and then have the Master destroy it in the next). As for Tegan, well, much as I wanted to like her (in part because she came from my part of the world! ), she was a little too loud and bad-tempered for my taste. I also wasn’t terribly fond of Turlough, who I thought was just too damn weird. Probably no scene exemplified this better than the final one of the aforementioned Warriors of the Deep, in which he, the Doctor and Tegan were standing in a room filled with corpses, and he announced, in that creepy deadpan voice of his, “They’re all dead, you know.” Hmm, thank you for pointing that out, Captain Obvious! *Mind you, this is coming from probably the only person on the face of the planet who actually liked Jar Jar Binks in the new Star Wars films, so make of my opinion what you will! Zosimus, I think you’ve pretty much summed up the companions of the Peter Davison era. I certainly don’t disagree with any of what you said. 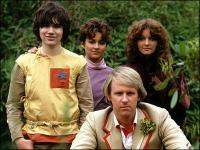 tegan more annoying than Adric ? I think not ! Yeah, ‘fraid so. Adric the maths boy wonder might have been a bit too goody goody at times, but my memory of Tegan was a lot of being unreasonable and screeching in anger.